Despite quite a prominent advertising campaign – including dominating the Regent Street lights – nobody I know went to see Mr Peabody & Sherman. Honestly, I’m not surprised – if the characters are popularly known in the States from their old cartoon appearance (I think in Rocky and Bullwinkle? ), they never made it over to the UK, and honestly they’re very hard to like. A know-it-all dog with incredible physical dexterity and a seven-year-old who is a long way from cute. There’s nothing about their adventures travelling through time that comes over as appealing or likely to strike a personal chord, and other than a few rather excellent moments near the end when different versions of the main characters end up in the same place at the same time, the film bears that out. It’s not very interesting, has very few laughs, doesn’t have appealing characters or designs, and overall is certainly one of the least impressive of Dreamworks’ films. 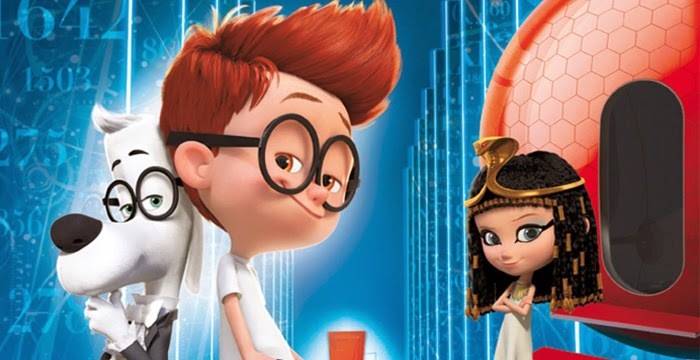 The story follows a dog who just happens to be a super-genius named Mr Peabody. Despite having invented a great many things – including some very silly ones – what he wants most is a family, and a home. So he adopts a young boy. Seeking to educate young Sherman, he begins to take him to different periods in a ‘wayback machine’ to show him first-hand some of the most significant events in history. Of course, this is all loose and slapdash for the sake of comedy – Sherman points out that the George Washington story with the cherry tree is apocryphal, yet we have the French Revolution depicted as having started as a direct result of Marie Antoinette saying ‘Let them eat cake’. On his first day of school – wow, American kids start their education late – Sherman’s grounding in history is evident as he can answer all the questions, upsetting a girl called Penny by correcting her. She is a really nasty piece of work – something the film’s redemption arc for her never comes close to satisfactorily undoing, even if she’s seven – and bullies Sherman in a more literal ‘racism’ than that of real life. He was adopted by a dog, so he must be a dog too, she reasons. The two of them end up fighting and Sherman bites Penny. This leads to trouble – because a large bullish woman who is a pleasing mix of Miss Trunchbull and the Queen of Hearts who works for child services wants to take Sherman away. Now, since when we meet them, Mr Peabody is putting Sherman in mortal danger during the Bloody Revolution and escapes only by igniting a sewer full of methane which really should have killed the people pursuing them, she may have a point. Nonetheless, Mr Peabody arranges for Penny’s family to be there on the night of the inspection of his suitability as a parent, so that the kids can make up. And of course, the kids end up getting into the time machine. The adventure takes them to Ancient Egypt, where Penny almost marries Tutankhamen, then to Renaissance Italy for frivolities with Da Vinci to recharge, and then after a mishap with a wormhole back to Ancient Greece and into the Trojan Horse. Of course all of these time periods are replete with stereotypes, though not all of them national: witness Agamemnon as a big beefy jock. There’s not much that is very funny or engaging here – through mortal peril and too many poop jokes, Sherman and Penny get closer and puppy love is soon very evident. Things get better once an emergency leads the kids to go back to shortly before they left, resulting in the classic two-in-the-same-timeline matter-antimatter paradox and the best joke in the film being a decidedly non-kid-friendly one about what Mr Peabody must stop Sherman doing in this situation. Soon the film’s big climax explodes into silliness with space-time collapsing and going very fast somehow providing an equal and opposite gravitational reaction to a tear in the continuum, and Agamemnon saying ‘Don’t taze me bro’, which I can’t see anyone getting in twenty years’ time. This film just doesn’t have the heart it needs. It’s fundamentally a story about a father who loves his son, but it never really realises that, or makes it touching. It quite often comes close but it doesn’t quite get there. So all the snappy dialogue and impressive action sequences and silly minor characters can’t come together in something that can move the audience. So that is why it falls short – and why I’m convinced that Dreamworks are much better-off doing films with a serious fantasy premise and inserting humour than silly films and trying to insert sentiment. I seriously doubt Rob Minkoff will ever do anything again that comes even close to what he accomplished with The Lion King.